Music connects us, and if fate smiles upon us we can stumble upon a singularly unmatched musical experience. Such an occurrence recently made its way onto my own path. May 6, 2016 a dear friend invited me to a “small show and meet and greet” at a tea shop in a suburb outside of Chicago. She really knew very little about how the event would be presented, other than it was in a small capacity “venue,” that we would be meeting Billy Corgan, and then staying to hear him perform with his long time friend-band mate- and guitar player Jeff Schroeder. I peered curiously to the storefront opposite us, where a mass of people were already gathering around. After dinner we jumped across the street where a taller than usual door man let us in, checking our passes and crossing our names off a list. There were a few ladies with angelic auras working behind the counter. The room was simple yet curiously cool. 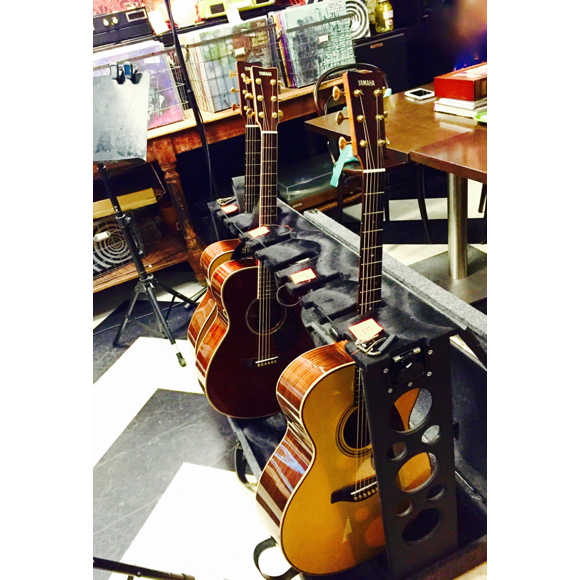 The first thing I noticed was the guitar stand near the front of the shop nestling a row of Yamaha acoustic 6 strings placed just in front of a room mic. Next to it stood a table covered with a checkered picnic-style tablecloth, and on it were a few simple pieces of equipment purposed to record live sound. I had to get a closer look. They were going to record live onto TAPE. Yes I said tape! Random antiques adorned the space, dream catchers perched near the register couldn’t help but catch my eye, stacks of vinyl near the front window reminded me of how much music has changed over time. All these items were available for purchase. Family style chairs and tables and large plates overflowing with vegan brownies made the shop cozy. Then I was immediately drawn to the table at the center of the room. There he was, Billy Corgan holding court, but in the most casual sense possible. He had on a baseball cap and a sweater with those clever elbow patches I love so much. Seated to his left was Jeff Schroeder. We were late to the meet and greet. Only 8 guests were permitted into this part of the event, and our late party was 4 out of 8. We hadn’t intended to be rude. Quite the opposite in fact. We just had no idea what we were getting into- and it was a most beautiful surprise. Billy and Jeff were well underway with entertaining questions, and the fan fare was charmingly self evident. I myself have always been a fan of Smashing Pumpkins. Billy is a superb songwriter, and his voice – chilling, warming, unmistakable – is emotionally transparent. My questions were more from the standpoint of a fellow musician. I wanted to know- what were their favorite venues and places to perform? They both agreed that places famous for producing well loved live albums were special to them, like The Ryman. I loved performing at The Ryman too. It was once a church, so feeling like you are having a religious experience on stage isn’t just one’s imagination. When you are on that stage looking out into the audience all you see are pews and stained glass windows. But the live recording aspect had never occurred to me. All of these were thoughts I kept to myself though, after all, this was about them and I wanted to hear more. Being typically me I also asked a technical question. I wanted to know about in-ear monitors and which they preferred to use during a live set. They gave each other a knowing smile and Jeff answered first. He’s sure on how he likes his in-ear audio levels mixed. It works perfectly for him and for his purposes as a creator and performing guitarist. Billy on the other hand is what I call “a purist.” He likes floor monitors and room sound. Since he plays the guitar and sings, it is necessary to perceive his live performance in a way that in-ear monitors won’t permit. Even though I don’t play and sing on stage at the same time, I knew the sensation he was expressing and related instantly. As the conversation continued he was quick to point out that social media and mass technological advances, although beneficial in many ways and a necessity, have actually distanced the consumers from the creators of the music. I listened and pondered. The entire room had a fire code capacity of maybe 42 people. It was so intimate. His voice was as beautiful as ever. They performed 17 songs if I counted correctly. 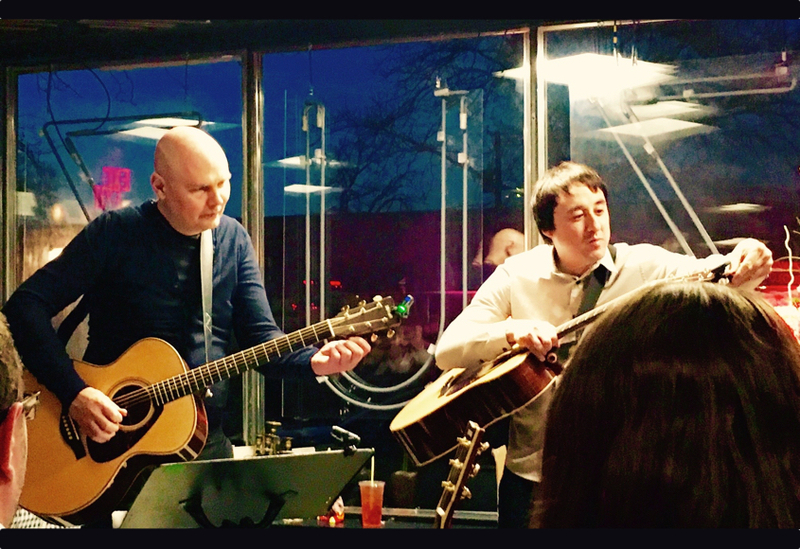 Billy and Jeff shared song after song with an indescribable ease of making music together. I was so entranced and feeling the mood that I didn’t even use my phone during his set! 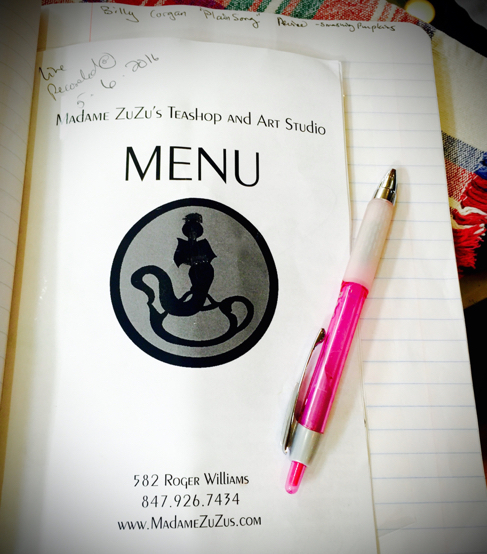 Since I had nothing to write on or write with I borrowed a pen from near the register and wrote on a paper Madame Zuzu’s menu, making notes furiously as my passion for music took over. Even though the whole show was impressive, the stand out moment came during a cover song. They performed “Something In The Way She Moves” by The Beatles. When the middle 8 came instead of going up to the notes for “you’re asking me will my love grow… I don’t know, I don’t know…” his voice dropped down. My heart almost exploded with artistic gratitude for this interpretation. Who drops down the octave on the bridge in this song???? 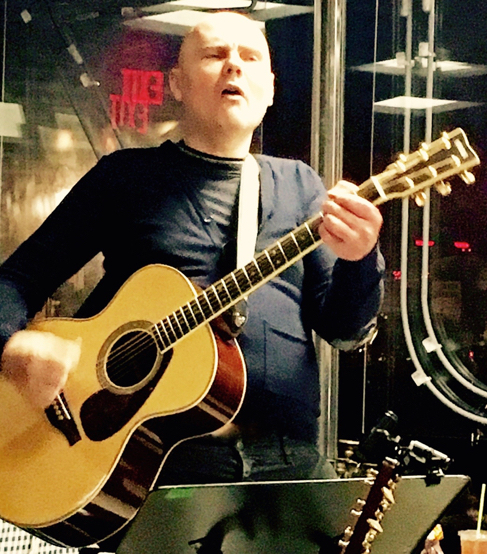 No one, only Billy Corgan, that’s who. I was enamored with this moment and wanted to hold onto it forever. Then I was reminded and felt it in the truest sense, it IS all about the music and the artist creating it, and moments like this, and the connection to the listener and the emotions that creation evokes. So I wonder, is the teahouse-style venue live acoustic experience the next generation of the Seattle grunge scene, the progenitor of consuming music in a live setting? I certainly hope so. At one point he stopped and said “thank you for listening.” Please Billy! Thank you for sharing your art. PS: The teahouse is comfortably exquisite and the brownies are delicious, but you won’t find them on the menu as they are provided to those who patronize the teahouse to accompany your beverage.